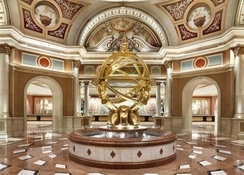 The Venetian Resort Hotel Casino offers the epitome of luxury and elegance as one of the most iconic resorts in Las Vegas. 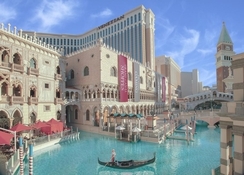 This eco-friendly resort with Venice-themed décor boasts world-renowned restaurants and bars, a state-of the-art casino, an Italian-style shopping mall, a dazzling array of pools and a fantastic spa club, while a ride along the Grand Canal in an authentic Venetian gondola within the hotel premises is a romantic moment like no other. Celebrity chefs cook up a storm in the hotel’s restaurants, while evening shows directed Hollywood directors as Baz Luhrmann and stand-up comedy shows by Eli and Mariano will keep you entertained throughout your stay. 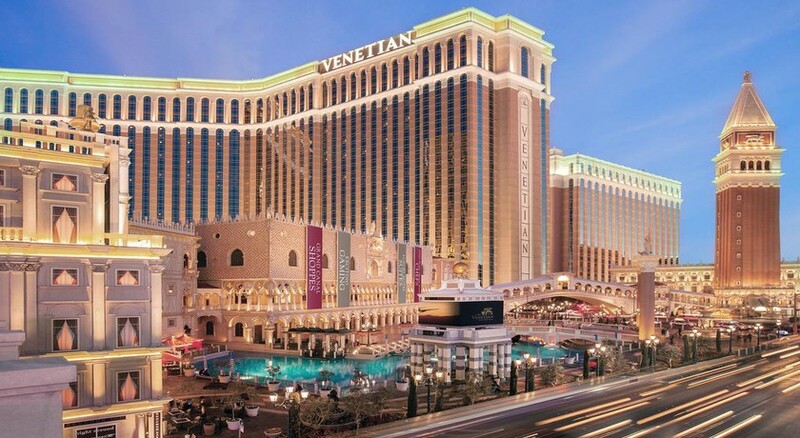 The Venetian Resort Hotel Casino is located in Las Vegas Boulevard and is perfectly positioned for guests to take advantage of the brilliant activities on The Strip. Las Vegas’ McCarran International Airport is just 4.5km away. 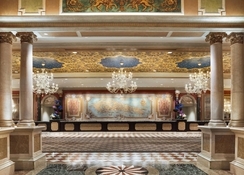 Accommodation at the Venetian Resort Hotel Casino comprises of well-appointed suites, complete with a separate living room, a sleeping area and an Italian-marbled bathroom. Among the most popular suites include the Luxury Suite, Rialto Suite, Piazza Suite, Prima Suite, Renaissance Suite, Penthouse Suite, Presidential Suite, Chairman Suite, Bella Suite. 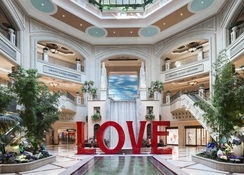 With an incredible 40 restaurants and bars to choose from, guests will be spoiled for culinary choice on their at the Venetian Resort Hotel Casino. Every discernible tastebud will be catered for with the finest examples of French, Italian, Asian and American fare available curated by world-famous chefs, as well as tasty quick bites, classy bars and lively pubs. Notable restaurants include Aqua Knox, Bouchon, Canaletto, Chica, Casanova and Hong Kong Café. Perfect for those looking to indulge themselves with a game or two during their Las Vegas holiday, the huge casino is the Venetian Resort’s marvelous centrepiece with options for table games, slots and poker to name but a few. Furthermore, there are shows held on a regular basis, from musicals to comedy performances, while the hotel boasts 10 pools spread over a total area of 1.2 acres. The Canyon Ranch Spa Club provides a wide array of upmarket beauty and wellness packages and for those seeking a spot of fun, the Tao nightclub is the place to be with its celebrity clientele and world-famous DJs.